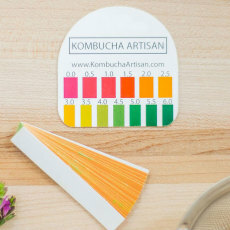 Kombucha pH Test Strips - 45 ct.
Home › Shop › Kombucha Making Supplies › Kombucha pH Test Strips - 45 ct. When it comes to making Kombucha, ensuring the proper level of acidity is key to a good tasting drink and a healthy SCOBY. Too acidic, and your Kombucha won't be drinkable. Not acidic enough, and you risk your SCOBY becoming infected and no longer usable. That's where these test strips can help! These test strips were specifically designed for use with Kombucha and are made by one of the top pH strip manufacturers in the USA! Simply dip one of the strips into your Kombucha, then compare the color on the strip to the included color key, and voila! Measures from 0-6 pH, in 0.5 increments.